Last week was our Technology Services World Conference in Las Vegas. It was our biggest conference ever, with over 1,300 attendees. I spent most of Tuesday doing more than a dozen 1:1 meetings with members, answering technology questions, helping them create a short list of possible vendors for a planned technology purchase, or giving them a map of exhibiting partners to visit in the EXPO depending on the problem they were trying to solve. 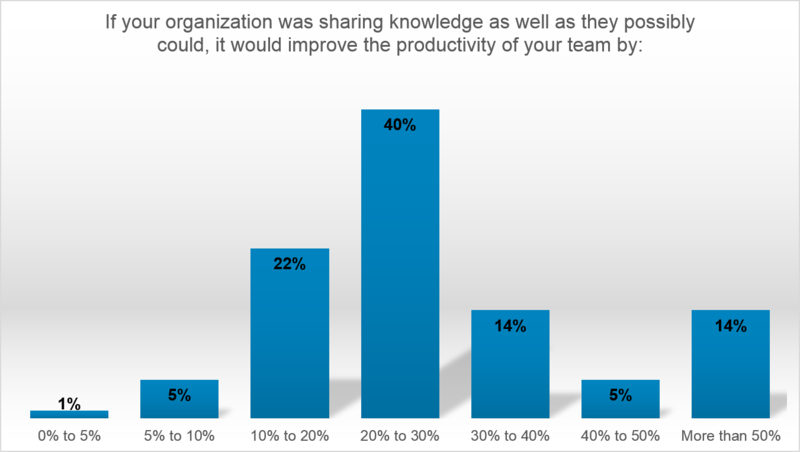 Since my Power Hour session on Monday was about the results of my August knowledge management survey, many of my member meetings were related to KM: what wasn’t working, what they would do differently next time, new technologies to invest in, etc. Based on questions asked during the KM session, and conversations with members and partners afterwards, here are some popular conversation threads I wanted to share with a larger audience. As you can see in these charts, I sorted all the KM survey responses into three groups by KM culture scores: poorest KM culture (bottom third), average KM culture (middle third), and strongest KM culture (top third). Then I looked at the average scores for each group for the question “How do you rate your existing KM system?” and it appears that culture plays a big role in how well a company’s KM program is going. For both customer-facing and employee-facing knowledgebases, the stronger the culture, the higher the KBs are rated. This played out in many member conversations, and at this point, I see culture as a primary indicator of KM project success. I’ve had a few eye rolls in the past when discussing crowd sourcing knowledge, but that tide seems to have turned. There was a lot of interest in how to incorporate customers into knowledge creation and sharing, with more companies saying they were using wikis or ‘tribal knowledgebases’ to build and curate a knowledgebase by and for customers (Jive Software, who exhibited at TSW, got a lot of booth traffic around this topic). The most telling story came from Scott Bideau, Regional Sales Manager USA West, Coveo, who also attended my Power Hour session. He said that when companies push back on letting customers create knowledge, he asks them: “How many of you truly know more about your customer than they know about you?” After a bit of soul searching, most companies admit that customers DO know more about them than they know about the customer. So why, if the customer does know so much about you (your products, your employees, your website tools, even your culture), why wouldn’t you want to tap into that expertise? Face it, customers who interact with your products in order to do their jobs have a different and likely deeper understanding of your technology than you ever will. Not taking advantage of that would be very sad indeed. This topic was discussed during my Power Hour, and also in several 1:1 meetings afterwards. I wrote about Knowledge as a Service, or KaaS, earlier this year as a hot KM trend, and I think the topic is getting some real traction. After sharing my survey data on “Rip and Replace,” showing that nearly half of companies were on their 3rd, 4th, 5th or more employee-facing knowledge platform, clearly a lot of service organizations have yet to find KM success, with the technology being a scapegoat for what is almost always a process problem. If companies can outsource calls, maintenance renewals, product testing, etc., to a strategic partner who can do it better, why not work with experts in knowledge management who can make your KM program a success? One of our KaaS partners, Klever, exhibited in the EXPO, so hopefully they had some good traffic on this topic. Thanks everyone who attended my session, scheduled 1:1 meetings, or sent emails about my KM survey results. And as always, thanks for reading. TSIA’s Technology Services World Conference kicked off on Monday with a series of keynotes and one round of breakouts. Yesterday was the first full day of the conference, and I wanted to give you a peek at the top attended sessions. With over 1,300 attendees, we had a lot of standing room only sessions (I’m happy to say they had to bring more chairs into my KM session on Monday). Clearly when you get 200 or more people attending a session, you know it is a topic that really resonates with service professionals. Create Customers for Life with Customer Life Cycle Management. The pressure is on for technology companies as investors are expecting high growth year over year. And while a company can achieve some of this growth through customer acquisition, many companies overlook the fact that the secret to high growth is by maximizing customer lifetime value and increasing customer retention. So how do you grow recurring revenue and keep customers longer? Customer life cycle management is the strategy that will help your customers get more value from your products and solutions resulting in more profitable client relationships. Hear best practices from Cisco and Cisco WebEx on how, with a disciplined approach to customer life cycle management, you can drive greater revenue growth and keep customers for life. Tom Lay – Director of Service Sales, Cisco Software Annuities, Cisco Systems; Tony Brucha – Director, WebEx Customer Success, Cisco Systems; Eric Jeffries – Vice President of Customer Success, ServiceSource, Inc.
Driving Profitability through Customer Analytics. By gathering feedback at each step of the customer journey, organizations can create a thorough understanding of the client experience and optimally manage it. Learn how to create a holistic customer feedback program and about how a top 25 accounting and business consulting firm uses customer insight to drive its customer relationships, internal innovation, go-to-market strategy, and business development. Rike Harrison – Chief Marketing Officer, Wipfli; Koren Stucki – Marketing Director, Customer Analytics, Verint Systems. Transform Your Company to Humanize the New Customer Journey. Customers have been spoiled. Thanks to companies such as Amazon and Apple, they now expect every organization to deliver products and services swiftly, with a seamless digital user experience. Many traditional organizations can’t meet the expectation of the new social contract, where the customer expectation is “you should always be there for me when I need you and you should understand the context of my problem–don’t contact me when I don’t want to be reached.” How will your organization adapt to this demand for intuitive interfaces, around-the-clock availability, real-time fulfillment, personalized treatment, global consistency, and zero errors—the world to which customers have become increasingly accustomed? We will define what this new customer looks like and expects across every step along their digital journey–from awareness, consideration, purchase, and service, to advocacy. Dean Shaw – Chat Program Manager, SAS Institute Inc.; Alon Waks – VP, Product Marketing, LivePerson. Challenging the Tiered Paradigm: Case Study in Moving an Organization from Handoff to Swarming. Tiered support is a keystone of standard support operations. It works predictably, but it’s inherently flawed. Service requests are owned and passed from one person to another like products on a conveyor belt. Once the conveyor gets to a person who can solve the issue, it gets solved. But until then, it has to follow its course and time on the belt, which slows down resolution. Customers lose patience being passed from person to person, and inherently, communication is inefficient, people lose context and we make the customer repeat steps and information. And, along the path, everyone can be doing “our job” but the customer doesn’t get what they need. Imagine a support organization without boundaries – where owners drive solutions by taking accountability for the customer experience and bringing resources to collaborate – to swarm on the issue. Then move that model to real-time with live first-engagement models like chat. The customer has continuity, accountability and accesses the best resource for the problem as quickly as possible. Tear down the tiers. In this session, we’ll discuss one company’s journey through that organizational change and discuss the challenges and approaches to the transformation. Linda Hartig – VP of Global Support Services (GSS), Avaya; Dan Pratt – Director, Strategy and Business Transformation, Avaya. Congratulations to these members and partners for creating such dynamic content that really spoke to the needs of the audience. Thanks for reading! Today at Technology Services World I am releasing the results of my August knowledge management survey both online, and in my Power Hour session at 4:15. The data shows that companies continue to find enormous potential in knowledge management, but are often thwarted by corporate culture, and tend to blame technology for process problems. Also, there is growing interest in emerging technologies that are changing the approach and priority of knowledge capture and sharing. 40% of respondents said that doing KM well could increase employee productivity by 20-30%, and a third of respondents said that KM had the potential of a 30-50%+ improvement. Every year KM technology tops the list of solutions companies plan to invest in, and this is the reason: they understand there is enormous potential for ROI by doing KM well, and they are allocating budget to make it happen. However, as I have said for years, and wrote a chapter about in my book Lessons Unlearned, the reason most KM programs fail is not about the technology, but process. Usually a new knowledge management platform is launched, everyone gets knowledge centered support (KCS) training, and support organizations see immediate results in lower resolution time and higher first contact resolution rates. But then sometime in year 2, things typically start falling apart. Key resources are pulled off projects, project champions move on to other priorities, and the number of dedicated knowledge workers declines. Content becomes stale, there are a lot of outdated and duplicate articles, and both employees and customers stop using the knowledgebase. According to the survey, only 35% of companies regularly update content on a daily or weekly basis, and 27% admit “We have not updated our content for a very long time.” Only 36% have a proactive process to identify content gaps, and 35% say they have zero tools or processes to find content gaps. Although clearly there are holes in processes contributing to the downfall of many a KM program, as soon as problems arise, the first thing everyone says is, “We need to find a new KM tool!” According to the survey, 48% of Employee-Facing knowledge implementations and 39% of Customer-Facing knowledge implementations are on their 3rd, 4th, 5th or more solution in recent memory. “Rip and replace” continues to be the most common approach to fix what is almost always a process problem. And guess what? 2 years later, if the processes don’t improve, they are in the same position and shopping for a new KM platform once again. A major shift to knowledge strategies in the last 5 years has been the number of content sources. It is a bit unrealistic to expect a large enterprise to have a single knowledgebase, but even if they do, they also have many other valuable content sources, including online communities, online documentation, release notes, etc. For this reason, search technology has emerged as a cornerstone of a successful knowledge strategy. I am a big advocate of unified search technology, which indexes all of your content sources–in any format in any location–and returns search matches based on concept (not key word) matching, as well as providing filtering options to drill down into exactly what you need. Federated search is less helpful; these search tools just leverage whatever search capabilities are inherent within each content repository and present a consolidated list of returns. The problem is federated search is usually a full text search, not a concept search, so if you search for ‘voice of the customer’ it won’t find ‘customer satisfaction’ or ‘customer experience,’ which are related concepts but different terminology. Only a quarter of companies have implemented unified search for employees and customers. More than half say that the search engine they offer for their knowledgebase ONLY searches the knowledgebase, meaning if there is relevant content in the community or online manuals, the user will never know about it. This comes up in the majority of my KM-related inquiry calls, so I’m hoping to see some movement in these numbers in the 2015 KM survey. For TSIA members, you can download a copy of the report detailing the survey findings later today on http://www.tsia.com. For those of you attending TSW, you can pick up a copy of the report in the TSIA EXPO booth. Thanks to everyone who participated in the survey. And, as always, thanks for reading! When was the last time you used your generic spreadsheet program to its maximum capabilities? Do you even know all it can do for you? Many of your clients have the same issues with the software you’re providing. You need to get to know your customer better before you can help them know your product better. You need to determine what they most need to truly benefit from the services you provide. When was the last time you received an email after you made a product purchase? Did you actually fill it out? No. I didn’t think so. That’s exactly my point. Get into the minds of your customers, in real-time, so they can tell you exactly what they think, when they think it, so you can make sure you deliver – and continue to deliver for a very long time – exactly what will delight, not just satisfy them. You need real-time, two-way communication to drive customer satisfaction. Consider every customer interaction to be an opportunity to delight. The question is how you can create two-way communication. 1. Always ask for feedback. Provide easy-to-answer questionnaires embedded in your mobile app or web application to let your user tell you what he thinks about your app, device or service. You’ll get very valuable “in the moment” data. During online support, provide a “Click on this button” survey, asking for his one-minute feedback. Add a sticker with a personalized QR code and URL linking to a survey on every hardware package. If you know who the user is, personalize the survey, upload the results into the CRM system, and react or act accordingly. Always give your users an incentive, of course. 2. Post your users’ feedback in your newsletters, on your website, or any other channel you use to get in touch with them. Be sure to point out what you’ve changed or improved based on the information, so they can see their participation gets results. If you’re using only 20% of an application, it’s easy to drop it and jump to another vendor. It’s incredibly important that your customers use your software or hardware to its full extent. Only then will your accounts be less vulnerable to your competitors. Embed questionnaires and quizzes within your applications. Use a “Did you know…. ?” style. Ask users to take small quizzes about some of the features. Add gamification: give them a score, let them earn badges. Give prizes to people who not only know the most, but also to highly active participants. At the end of each quiz, always ask for one minute of feedback. Track the answers. Not only are you driving loyalty, but also analyzing the scores allows you to measure the “user experience” and the effort it takes to learn new features. For every online interaction, let the customer tell you what he thinks. Did he really get the help he needed? Ask him explicitly. If he’s not happy, give him the chance to “click on this button” to get in touch with your priority helpdesk. Don’t just collect the data. Analyze it and make any necessary changes to your customer service process or to reorganize the way the team works. Your employees need to know more than your customers. They cannot support your customers unless they understand your products at the deepest levels themselves. Are they there yet? An advanced training program doesn’t necessarily mean that employees all have the required skills. Do you test them on a frequent basis? If not, you should. Define a process to review general and detailed scores and to take actions on individual and group performances. No matter what you do, though, make it fun. Gamification is critical to drive participation. Organize quizzes for all the required subjects. Ask your employees to take them at different levels, from junior to expert. Reward them for their expertise and participation. For these companies without a formal training program, create one using the collective intelligence of your employees – crowd-source it. Ask each person to take a specific product to create quizzes and try them on their fellow employees. You’ll end up with a full training library at a low cost. Formalize it. Gamify it, too, by department, area of expertise, etc. Success for your organization means satisfied customers. Get everyone on board to drive customer delight in real-time. Each Spring I launch the TSIA Member Technology Survey, which tracks adoption, satisfaction, and planned spending across 24 categories of tools and services common within service operations. The survey reveals which solutions are most popular with TSIA members, and it is interesting to find out which vendors see growing adoption. One thing is certain: When the percent of members using a particular solution sharply rises, it indicates that provider has the right messaging, the right tools, and the right price for technology service organizations. Proven success within the TSIA membership means the solution meets the business needs of users, is delivering value, and doesn’t require extensive implementation or customization to be effective. Comparing the results from 2013 and 2014, the three TSIA partners that saw the largest increase in member adoption are Changepoint, LivePerson and Verint Systems. These three firms represent the finalists in the 2014 TechBEST Best in Adoption Award and will be interviewed in the TechBEST Showcase that opens Technology Services World today in the EXPO Theater. The partner with the highest year-over-year gain in adoption will be named the winner during the opening EXPO on Monday, October 20th. Changepoint. Changepoint is the leading global provider of Professional Services Automation (PSA) and Project Portfolio Management (PPM) solutions. The world-class product portfolio offers an unparalleled breadth of PSA and PPM capabilities, meeting diverse market requirements in both functionality and spectrum of delivery methodologies. From the largest and most complex enterprises to small and mid-sized organizations, Changepoint offers robust solutions that are available on-premise, hosted or in a pure SaaS model based on the specific needs of its customers that are located around the world and across industries. LivePerson. LivePerson is the leading provider of live digital engagement solutions for business of all sizes. Through predictive intelligent targeting, LivePerson’s multi-channel platform, LiveEngage, helps brands understand their site visitors’ intent and value, enabling them to meaningfully connect through the most appropriate type of engagement—including chat, voice, video, and content —and do so across all channels and devices. Through LiveEngage, businesses experience increased sales, improved service levels, while maximizing online marketing efforts. LiveEngage effortlessly manages all online customer interactions, and is simple enough for small business clients while still powerful enough to meet the requirements of our enterprise clients. In addition, LiveEngage is able to learn from every interaction, creating a feedback loop that enriches intelligence and optimizes future engagements, further enhancing business results. Verint Systems. Verint® is a global leader in Actionable Intelligence® solutions and services. Its customer engagement optimization software and services help organizations optimize their workforces, improve enterprise processes, and enrich customer interactions to make them more engaging, contextual, and personalized while providing employees with information for delivering service more effectively. The Verint solution portfolio brings together proven workforce optimization and customer analytics solutions with advanced customer service capabilities from KANA®, A Verint Company. It includes workforce management, voice recording, voice biometrics, quality monitoring, speech analytics, text analytics, enterprise feedback management, engagement analytics, performance management, desktop and process analytics, elearning and coaching, along with knowledge management and other multichannel customer service solutions. From interactions in contact centers, branch offices, and marketing and customer care to the underlying back-office processes for service delivery, Verint solutions provide visibility into performance, operations, and customer intelligence across the enterprise. To learn more about these partners, please attend the TechBest Showcase which opens TSW at 12:45PM on Monday, October 20th. Hope to see you there! And as always, thanks for reading! Capturing, sharing and maintaining knowledge is always a popular topic at TSIA Conferences, and at our upcoming Technology Services World in Las Vegas, October 20-22, there will be a lot of great content on this hot topic. Our 2nd annual knowledge management survey was completed in August, and I’ll be revealing the findings and publishing the results at the event. I’ve had mulitple inquiries over the last week asking what KM content will be featured at the show, and what exhibitors in the Expo offer knowledge management tools and services, so here’s a peak at KM-releated sessions and exhibitors so you can start planning your time now. First up are the breakout sessions focusing on knowledge management. For detailed sessions descriptions, see the TSW agenda online. Transforming Knowledge Management: Hot KM Trends. In this Power Hour session on Monday at 4:15, I’ll walk through the results of the KM survey, including information on KM across service divisions, and emerging technology areas such as mobility, video, unified search, expertise management, etc. Three Months, 300% Productivity Improvement: Transforming Customer Success Using Rapid Knowledge Sharing. Phil Verghis, Klever; Mitchell Spence, Tyler Technologies, Inc. Tuesday, 2:00 PM. Using KCS and Discovery Based Consumption Analytics to Generate Proactive Support Deliverables and Guaranteed Customer Outcomes. Rob Baker, Akamai Technologies, Inc. Tuesday, 3:30 PM. OK, We’ve Done KCS. What’s Next? David Kay, DB Kay & Associates; Sean Murphy, Riverbed Technology, Inc. Tuesday, 3:30 PM. From Knowledge Hoarding to Solve-Once: Aligning Support around a Knowledge Culture. Linda Hartig, Avaya; Dan Pratt, Avaya; Joey Fister, Avaya. Tuesday, 4:45 PM. Knowledge: Experience Sharing of KCS Implementation. Nicolas Brunel, Alcatel-Lucent Enterprise. Wednesday, 11:30 AM. If you are attending TSW and would like to discuss your KM strategy, I have open slots for 1:1 meetings on Tuesday, 10/21. When you arrive at registration, ask to schedule a 1:1! Thanks for reading, and I look forward to seeing you in Las Vegas! You are currently browsing the Ragsdale’s Eye on Service weblog archives for October 2014.